Republican David Jolly wins Florida-13: Three things everyone's getting wrong about the victory. From the reporter’s perspective, the election for Florida’s 13th District was monumentally depressing. Previous, eyes-of-the-nation special elections have produced stars like New York’s Kathy Hochul, or characters like Mark Sanford, people who ran hard and were transparent to the press. 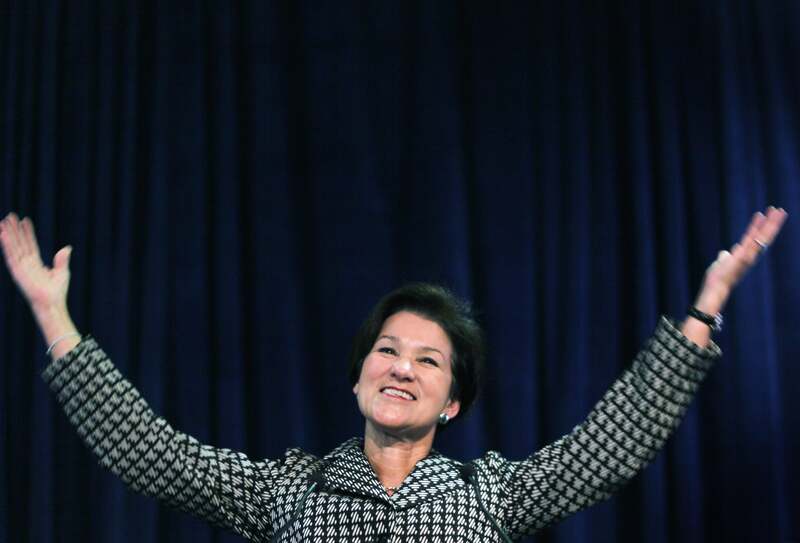 The Pinellas County race pit Alex Sink, an uninspiring corporate Democrat, against David Jolly, a say-anything lobbyist who spent half a week of the stretch sleazily and baselessly calling his opponent a “bigot.” Both of them came off like people desparately trying to sell you a time share. Neither was particularly open to the press, and both rejected the national “narrative” that the race was a clear referendum on Obamacare. In Jolly’s candidate announcement speech, he mentioned 12 times that he (unlike Sink) was from the county, but he didn’t mention Obamacare once. Sink bristled when reporters asked her about the implications of the race. Democrats closed the gap in a tough Republican district. This is the preferred spin of the DNC, but it’s bogus, and does the party no favors as it explains how it can hold off losses in 2014. In 2014 barely 47 percent of voters chose Sink to represent them in Congress. How much worse was than that previous Democratic campaigns? Actually, I can save everyone some time and just reprint the background info from a October 2013 DCCC email on the race. President Obama won a majority of the vote across the district in 2008 (51.9% of the vote) and again in 2012 (50.7%). In 2010, in a challenging election cycle for Democrats, Democratic gubernatorial candidate Alex Sink received 51.1% of the vote in FL-13 despite losing statewide to Rick Scott. In 2006, Democratic Senator Bill Nelson won the district with 63.7% of vote, compared to the 61.3% he received statewide. In November, Sink was leading the unknown Jolly by as much as 20 points. As recently as January, the DCCC was including FL-13 in its list of top “open seat opportunities.” And I’ve got maps. 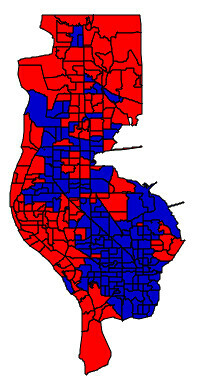 Here was how Pinellas County voted in 2012, precinct by precinct—red for Romney, blue for Obama. Here’s how it voted, that same year, in the race for FL-13. 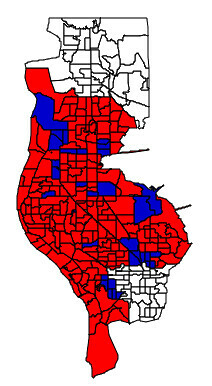 (The district does not include all of Pinellas, hence the white spaces.) And here’s how it voted yesterday. Sink clawed into some of the old Bill Young turf, but lost neighborhoods that had voted for her and Obama. 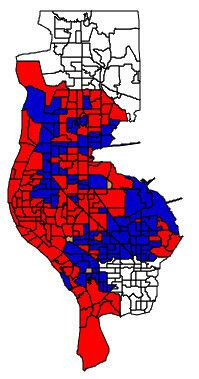 She came to a slightly blue district and watched it go red. A fall-off like that in other districts and states would be devastating to the 2014 Democrats. Montana, Alaska, Louisiana, South Dakota, West Virginia, North Carolina—all of those states are redder than FL-13, and all have Republicans running to take Democratic Senate seats. The Democrats were outgunned and outspent! That’s not actually true, though it’s the basis of analyses from the Nation and the Center for Public Integrity. Going into the last week, outside groups boosting Sink had outspent outside groups for Jolly by $1 million. Sink’s campaign outpaced Jolly’s, in campaign spending, by a similar margin. Look at the 2014 map—how many races, how many states, will see the Democrats outspend the Republicans? In North Carolina alone, David Koch’s Americans for Prosperity has already spent millions on TV ads against Sen. Kay Hagan. Arkansas Sen. Mark Pryor has tapped into his finances early to counter a blitz from the Club for Growth, one that started more than a year ago. Democrats had a better candidate and she lost because of Obamacare. Honestly, having seen both Sink and Jolly in action, I reiterate what I wrote at the top. They were both lousy. Sink wasn’t from the district, which hurt her on the margins. Jolly was slicker than Sink, but ran a pretty transactional campaign about knowing how to pick up Bill Young’s portfolio and start sprinting. It was reminiscent of the campaign Democrat Mark Critz ran to hold the late Rep. John Murtha’s seat, in 2010—a staffer promising to keep the wheels turning. Some of the outside ads focused not on Obamacare, but on Sink’s record as CFO. ) And even the Obamacare-centric ads warned voters that the problem with the law was that it would cut Medicare. Not exactly a “repeal Obamacare” campaign there—the U.S. Chamber’s ads, interestingly, didn’t even suggest that the law needed to be repealed. They referred to the “Obamacare mess.” It resonated, and I suppose Democrats with more talent than Sink can find ways to finesse Obamacare in eight months. Unlike Sink, though, most of them will have on-record votes for the law.